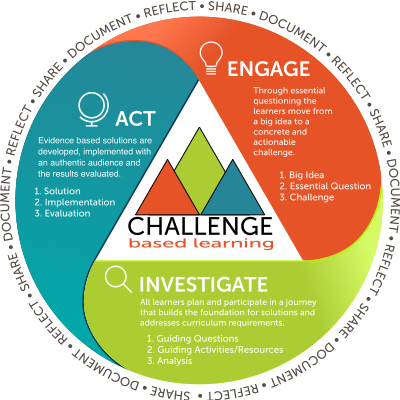 The Challenge Learning Framework is divided into three interconnected phases: Engage, Investigate and Act. Each phase includes activities that prepare you to move to the next phase. Within each of the phases there are opportunities for mini-investigation cycles and if necessary a return to an earlier phase. Supporting the entire process is an ongoing process of documentation, reflection and sharing. During the Engage Phase, the Learners move from an abstract big idea to a concrete and actionable challenge using the Essential Questioning process. The goal is to personally connect with academic content through the identification, development, and ownership of a compelling challenge. A Big Idea is a broad theme or concept that can be explored in multiple ways and is important to you and the larger community. Examples of big ideas include Community, Relationships, Creativity, Health, Sustainability, and Democracy. By design, the big idea allows for the generation of a wide variety of essential questions that reflect personal interests and the needs of the community (e.g. Why is this important to me? Where does this concept intersect with my world? etc.). At the end of the Essential Questioning process is the identification of one Essential Questions that has personal meaning. The challenge turns the essential question into a call to action to learn deeply about the subject. A challenge is immediate, actionable and builds excitement. The Engage phase concludes with the identification of a compelling and actionable Challenge statement. Building from the Challenge Learners develop contextualized learning experiences and conduct rigorous, content and concept-based research to create a foundation for actionable and sustainable solutions. The Investigation phase begins with generating questions related to the Challenge. The questions include everything that needs to be learned to develop an informed solution to the challenge. The questions are categorized and prioritized creating an outline for the learner’s journey. Any resource or activity that helps answer the guiding questions and develop an innovative, insightful, and realistic solution can be used. Examples of Guiding Resources include: online content and courses, databases, textbooks, and social networks. Examples of Guiding Activities include: simulations, experiments, projects, problem sets, research, and games. Once all of the Guiding Questions have been addressed and the results of the Guiding Activities recorded, the learners analyze the accumulated data and identify themes. The Investigation phase concludes with reports and presentations that demonstrate the learners have successfully addressed all of the Guiding Questions and developed clear conclusions that will set the foundation for the solution. In the Act Phase evidence-based solutions are developed and implemented with an authentic audience and the results evaluated. The Learners combine a desire to make a difference with a demonstration of content mastery. Having completed the Investigation phase, the learners have a solid foundation to begin developing solution concepts. Solution concepts may involve plans for a campaign to inform or educate, school or community improvement projects, product development, or other activities. After developing their solutions, the learners implement them, measure outcomes, reflect on what worked and what didn’t and determine their impact on the challenge. When implementation is complete, learners can continue to refine the solution or develop a completion report and share their work with the rest of the world. Throughout the Challenge, Learners document their experience using audio, video, images, and photography. The ongoing collection of content provides the resources for reflection, Informative assessment and the documentation of the learning process.